Greenery may fulfill a superficial need to improve the landscape aesthetic, but plants play a much more critical role in regular life function, converting carbon dioxide to oxygen through a process called photosynthesis. Panasonic is among the companies attempting to replicate this natural procedure through artificial means, and it looks like the Japanese electronics maker is well on its way towards a viable solution. Presenting at the International Conference on the Conversion and Storage of Solar Energy this week, Panasonic announced the development of an Artificial Photosynthesis System, which uses a nitride semiconductor to convert water and carbon dioxide -- a byproduct of factories and power plants -- into an organic material called formic acid, which is used in the manufacturing of dyes and fragrances. Covering the planet in formic acid wouldn't necessarily represent progress, but assuming demand isn't exceeded, it certainly beats CO2. Best yet, Panasonic claims that the system converts the substances at plant-like efficiency rates, or 0.2 percent. Hit up the PR after the break for a more granular look at the company's creation. Panasonic Photos! 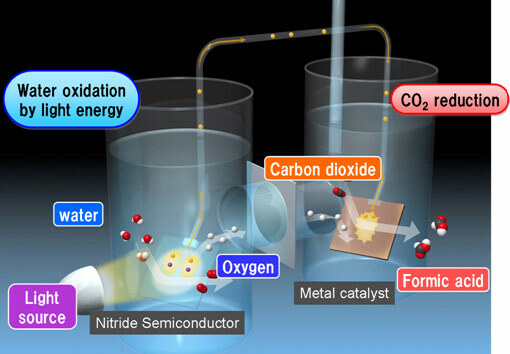 ynthesis System converts carbon dioxide to organic material with plant-like efficiency originally appeared on Engadget on Tue, 31 Jul 2012 06:41:00 EDT. Please see our terms for use of feeds.